As a gay in my early 40s who has been out for 25 years now, I have begun to notice that my primary affinities are not necessarily with other people of my chronological age, but people who are the same queer age. I came out in the era of ACT UP and Queer Nation, chained myself to buildings and sat in on major thoroughfares; I remember television without a single LGBTQ-identified character and life before Gay/Straight Alliances were a thing. 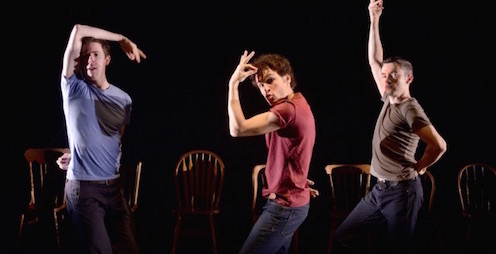 As a piece, The Gay Heritage Project at Buddies In Bad Times moved me particularly and profoundly in part because I remember – I remember when coming out necessarily meant joining a multi-generational community; I remember when we danced all night and went right to direct actions still smelling like the club and the home fries of afterwards. I am not sure that my memories are what made me love this show so wholeheartedly, though. Here’s what I loved best about The Gay Heritage Project – it grapples. In the great room of what we might consider gay history, or gay heritage, there are so many possible cupboards to dip into. How do we decide who to claim? What stories do we hear, which are hidden or erased, and why? What do we do with complicated people and behaviors? How do we know what we can’t know? Rather than pasting a happy lavender smile on the question of Gay Heritage and calling it a day, The Gay Heritage Project feels like it remains a project. This is an open question, and the piece asks more questions than it answers, which pleased me to no end. Creators/performers Damien Atkins, Paul Dunn and Andrew Kushir felt like they truly earned their titles with this one. The trio obviously mined their own pasts and interests heavily in order to bring out the most interesting pieces for our audience delectation, and all resisted the urge to just do the awful bits. The show opens with Atkins as a boy of eight or ten, recreating an Olympic figure skating routine with tremendous verve. The piece dips back and forward through time, alternating the brutal with the hilarious, and treating difficult questions largely by invoking the question itself rather than attempting to answer it, embodying concepts as characters when necessary to make it work. In this way, we see the personification of HIV, Gay Desire (and his sisters Camp, Drag, and Joan Crawford), the library search engine and more. Each of the performers has superlative timing and characterization skills, which they need every ounce of as most of the scenes – even those with multiple characters – are played by one actor embodying all the roles. They sketch in characters with body language, accent and timbre, gestures and word choices, and they do an excellent job. After a while though, I started to wonder why I wasn’t seeing more scenes in which each actor played a different character. Having each scene basically in its own silo, with relatively few exceptions (most of them for close-harmony singing) started to feel odd. Also odd: the discussion of Catholic School GSA hero Lee Iskander without acknowledging their current name or gender presentation. Did they just not know, or did they decide it would be too difficult to explain? I wasn’t too clear about this choice. That, though, is a fairly singular quibble in an otherwise delicious and nutritious evening. I loved this clever, thoughtful show. I loved hearing who around me laughed at which jokes and shibboleths, I loved watching as understanding dawned on some of the younger faces, I loved the feeling of being in the middle of a very interesting question being wrestled with in real time. Which, ultimately, is everything I think theatre should strive to be. The Gay Heritage Project plays at Buddies In Bad Times, 12 Alexander Street, until January 31st. Ticket prices range from $20 to $37, Sunday matinees are Pay What You Can.